Paramount has come up with a unique way to get fans to share viral content ahead of one of its biggest fall releases. The marketing team for the studio's hit horror franchise, Paranormal Activity, has partnered with video mixing start-up, Ptch, to inspire fans to create their own Paranormal videos. The mobile video editing app launched just this past July allows users to mix audio, video and graphics to create and share videos. For the promotion, Ptch users will be able to use Paranormal movie assets such as audio, video and pictures from the film, to create their own Paranormal-inspired mobile videos. 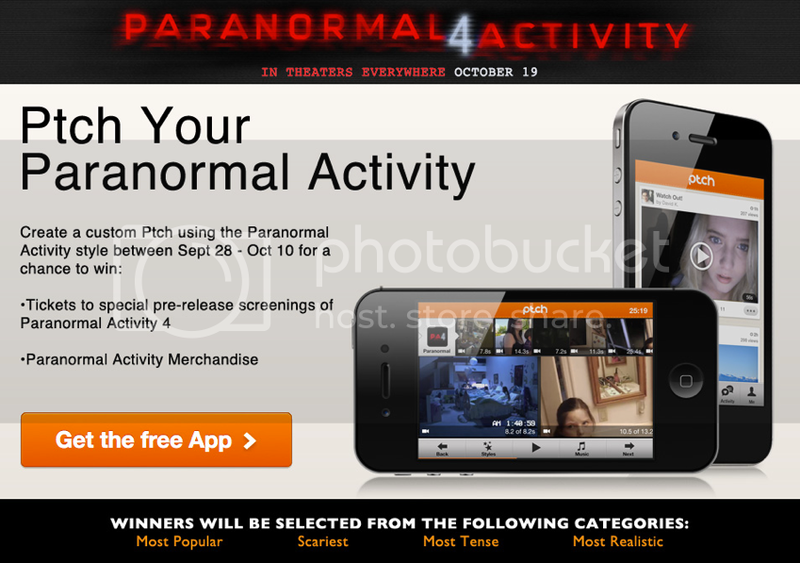 Fans that create, mix and share their own “Paranormal" video could win tickets to be first to see Paranormal Activity 4 in their local theater, as well as, win movie merchandise. Winners will be chosen from a variety of categories including Most Popular, Scariest, Most Realistic, and Most Tense. Deadline for the contest is October 10th. Watch the promo reel for the contest here and look for other big media spenders to increasingly start teaming up with start-ups that can engage avid audiences with first of its kind partnerships like this.